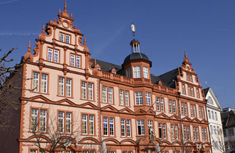 The Mainz Institute for Theoretical Physics (MITP) is located on the campus of the Johannes Gutenberg University Mainz, accessible by a 30-minute train or car ride from Frankfurt International Airport (FRA). Car route from Frankfurt-Hahn to Mainz: Take highway B 50 to get to Autobahn A 61, on-ramp "Rheinböllen" direction "Ludwigshafen." At "Dreieck Nahetal" change to Autobahn A 60 direction Mainz. Leave Autobahn A 60 at exit "Saarstraße". Travel Autobahn A 60 crossing "Autobahn-Dreieck Mainz" direction Darmstadt. Leave Autobahn A 60 at exit "Mainz-Finthen". Follow the street sign "Saarstraße / Innenstadt" straight ahead through the traffic circle "Europaplatz". Travel Autobahn A 60 crossing "Autobahn-Dreieck Rüsselsheim" OR travel Autobahn A 63 crossing "Autobahnkreuz Mainz" to get to autobahn A 60 direction Bingen. At "Schiersteiner Kreuz" change to Autobahn A 643 direction Mainz. Follow Autobahn A 643 to "Autobahn-Dreieck Mainz" and change here to Autobahn A 60 direction Darmstadt. Follow the street sign "Saarstraße / Innenstadt" straight through the traffic circle "Europaplatz". Parking on campus is available only with special permission. Please see the campus map for parking in the nearest vicinity of the campus. Parking is also available at the near-by football stadium, which is about 200 meters from the University’s main entrance. The City of Mainz has one main and multiple other train stations. Schedule information is provided by Deutsche Bahn. 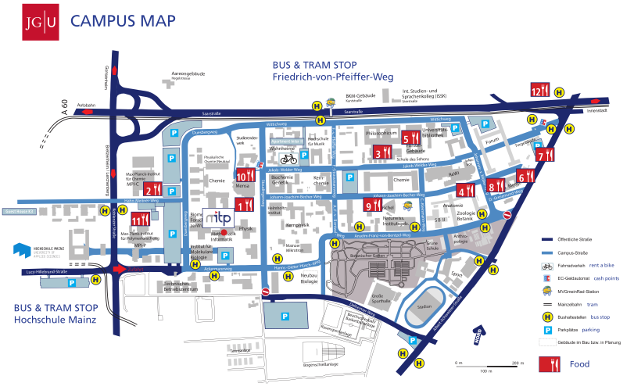 Mainz Main Sation is the most convenient one to get to the University by taxi or by bus / tram. A short bus ride brings you from the Main Station to University. After leaving the train, follow sign "Exit City". Take tram line 51 (platform A) or 53 (platform L) (direction: Mainz-Lerchenberg) to Friedrich-von-Pfeiffer-Weg (5 min.). 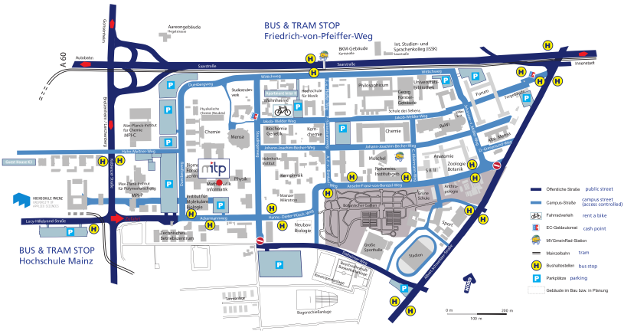 Alternatively take bus lines 54 / 55 / 75 / 650 to Friedrich-von-Pfeiffer-Weg (5 min). To Friedrich-von-Pfeiffer-Weg you will only need a “Kurzstrecke”-ticket (up to three stops) to be purchased from the driver. For longer stays: Seven-Day Tickets (Wochenkarten) are available at MVG ticket machines or MVG ticket shop opposite Mainz main station. This ticket is valid on 7 consecutive days for Mainz and Wiesbaden. In general you can buy the bus ticket directly from the bus driver or use an automatic ticket machine. Information on public transport within and around Mainz is provided by Rhein-Main-Verkehrsverbund. Kindly be informed that all participants are responsible for their Visa themselves. For information on visa regulations, please visit the Federal Foreign Office Website or contact the German embassy in your country. If you need any official letters, confirmations etc. in order to apply for your visa, please do not hesitate to contact the MITP Guest Relation Team. MITP will organize and assume the costs for local housing in Mainz for accepted participants. Housing will be conveniently located in Mainz near the campus so that participants can easily commute via public transportation. 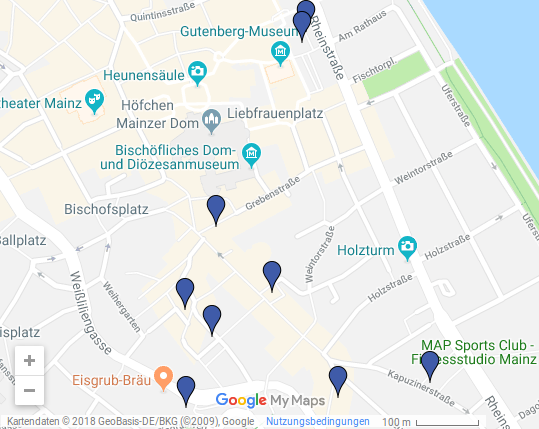 If you have any special needs like travelling with family or in case you will stay in Mainz only during the week and plan to spend the weekend somewhere else, please inform the MITP Guest Relation Team in advance. On your first day at MITP, please check in at the MITP Guest Relations office to obtain the keys to your office. Certificate of Attendance will be issued on request. Please refer to the MITP Guest Relation Team. If you plan to be away from the MITP for more than 24 hours, please notify one of the staff members of your intended absence. Absences from the MITP will affect your housing, so it is very important that you discuss any absences with the MITP Guest Relation Team. The username and password will be provided to you. If your institution is participating in eduroam, you can connect to the eduroam wireless network using your institutions login credentials. Please note: Our printer cannot be used within the eduroam network. There is a printer available for you in the MITP Printing Room (02-613). When using OS X and Linux it is necessary to download and install the printer driver first (please follow the link on the right). The MITP guest offices are equipped with telephones. For calls inside the University you only need the 5-digits extension. A list of all office phone numbers will be provided. For phone calls outside the campus please dial "0" to obtain an exterior line. You will need the "Studicard" to pay for lunch in the University Mensa. The card is available at the Studierendenwerk office which is located next to the stationary shop on the upper floor of the Mensa. It can also be used for payments in the Cafeterias on campus. You can charge the card with an amount of up to 200 EUR at any of the payment stations located throughout the campus. Cash payment is possible only at the Mens@ria Cafeteria on the upper floor of the Mensa. A basic first aid kit (orange box) is located opposite the black entrance wall towards the east wing corridor. Sparkasse Mainz (Albert-Schweitzer-Straße / Saarstraße) and Mainzer Volksbank (Staudingerweg) have ATMs on campus. You can find a list of various banks in Mainz online on the Website of Gelbe Seiten. Please return your office keys to the MITP Guest Relations office. Please note: In the MENSA, you can pay only with the University cash card "Studicard" which is available at the Studierendenwerk office which is located next to the stationary shop on the upper floor of the Mensa. 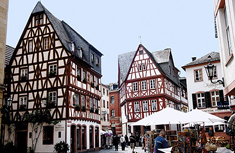 There are a variety of car rentals in Mainz or Frankfurt Airport. Wochenkarte (Seven-Day Ticket): This ticket is valid on 7 consecutive days for Mainz and Wiesbaden. It is only available at the MVG office near the main station (Bahnhofsplatz 6a) or at the ticket machines. Tageskarte (Day Ticket): Perfect for day trips. Hop on and off as often as you like. Valid until 4 am of the following day. Ticket available at ticket machines or from the driver. They stock a variety of second-hand bikes, which they also rent out. You will have to pay the full price of your chosen bike in advance as a deposit. When you return the bike, the deposit will be refunded and you will only be charged about 10 EUR per week. How to get to the Gutenberg Center? Lines 68 or 650 from the following stops: Friedrich-von-Pfeiffer-Weg, Koblenzer Straße / HDI Gerling, or Ackermannweg / FH (direction Klein-Winternheim). Get off at Gutenberg Center. Various supermarkets are also located in and around the main station. Furthermore, gas stations usually offer a small variety of food, so you can shop there on Sundays and weekdays after the closing time of the supermarkets. (enter "Mainz" in the box labelled "PLZ / Ort", press search button "suchen"). For medical assistance you can consult any resident doctor during his or her consultation-hour. Behind Vinzenzkrankenhaus, they start work on Friday afternoon around 3 pm and are responsible during the weekend. They do speak English and they can make prescriptions. Call any resident dentist or +49 1805 666160 for emergencies after hours.